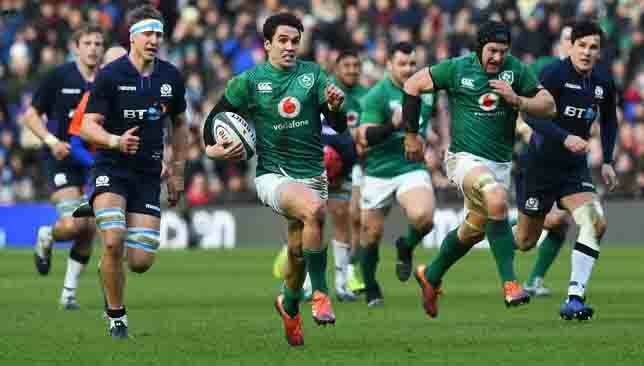 Joey Carbery steered Ireland to a redemptive but patchy 22-13 Guinness Six Nations victory over Scotland, as Joe Schmidt’s men edged back to winning ways in Edinburgh. Here’s our report card from a thrilling contest. Ireland stars: Sean O’Brien and Jack Conan looked superb, bringing some fearless ball-carrying, clever ruck play and superb tackling ability. Both players were abrasive in the tackle with O’Brien (12 tackles) and Conan (18 tackles) stepping up when they were needed most. At full-back Rob Kearney looked dangerous on the counter, making a superb break that led to Keith Earls try in the second half. The 32-year-old ran a stunning 91 metres, making three clean breaks and beating five defenders. Set piece: Ireland dominated their set piece, winning 11 out of 11 of their line-outs and all 10 of their scrums. In contrast, Scotland lost three of their 10 line-outs but had a 100 per cent success rate at scrum time. It was off the set piece that Ireland looked sharp as they initiated some formidable attacking opportunities, but for all their possession and territory in second half, should have put some more than 10 points on the scoreboard. Scotland mistakes: Although Ireland were guilty of making plenty of errors, Scotland had their fair share too, gifting Murray an early try following a defensive mix-up. They also conceded seven penalties and were unable to convert some chances they had on offer. After the break, their focus and commitment dropped and they looked very much on the back foot with just 33 per cent possession and 28 per cent territory. The slack defending was evident when Allan Dell and Rob Harley failed to tackle Carbery and the Munster man paved the way to send Earls in from close range. Gregor Townsend’s side need to bounce back with a consistent display against France in two weeks time. 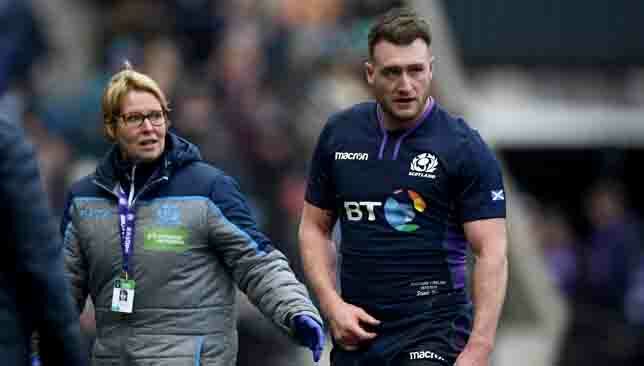 Loss of key men: For Scotland and Ireland to lose Stuart Hogg and Johnny Sexton in the opening 30 minutes was a significant blow, not just for the game itself but for their prospects of the remainder of the tournament. Hogg, in particular, will be a serious loss for the Scots. The 26-year-old makes the magic happen with ball in hand and it will be hoped his shoulder injury won’t rule him out for round three. While Sexton continued to play after picking up a facial injury, Schmidt opted to replace him after 24 minutes. Joey Carbery be a class act in his own right, but Sexton’s distribution and kicking game is a difference level compared to his younger team-mate. 7 minutes – Laidlaw converts an early penalty after a positive start from the hosts (3-0). 10 minutes – Stockdale stabbed a kick through, and a mix up in defence, saw Murray collect possession and dive out for a try. A score out of nothing (3-5). 28 minutes – Finn Russell showed great awareness to steal an intercept from Carbery. He sprinted into the Irish 22 and popped it off to Sam Johnson to score (10-12). 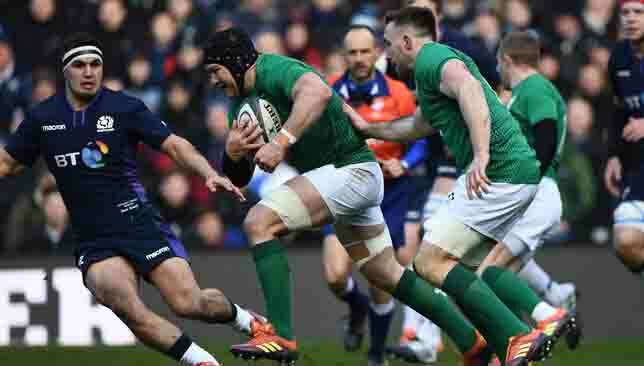 55 minutes – Carbery glided past two Scotland players, broke into the 22 and floated a pass out to Keith Earls to cross the line. Carbery made no mistake with the conversion. Sensational score for Ireland (10-19). 62 minutes – Laidlaw makes no mistake with a penalty out wide on the left flank. He’s now on 666 international points, one behind Gavin Hastings on the all-time standings (13-19). 68 minutes – Carbery lands the kick, and Ireland have a useful cushion going into the final stages (13-22). Scotland were putting all the crunching hits in early on and looked dominant. Under intense pressure, Ireland got a lucky break when a defensive mix-up allowed Murray to collect possession and score the first try. Losing talisman Hogg, Ireland found space shortly after and stamped their influence on proceedings with a score through Stockdale. But the visitors made life difficult for themselves, allowing Scotland back into the game at every opportunity when they went ahead. Johnson’s try did put two points in at the break but Ireland upped the tempo slightly in the second period to hang on for victory. A lack of fight in the second half will disappoint Townsend. Mistakes and weak defence cost them at crucial moments. Without key man Hogg, they lacked inspiration going forward and enjoyed only a small fraction of possession and territory in the second half. The visitors put together some impressive attacking plays in the second half but still plenty of work to do if they are to go on and challenge Wales and England for the Six Nations title. England entertain France at Twickenham on Sunday for the latest edition of Le Crunch (19:00 UAE time). Here, we look at three talking points ahead of the clash. The Red Rose were immense for large spells of the game against Ireland and look back to their best again under Eddie Jones. The physicality, energy, accurate decision-making in attack and defence, and general class with the ball in hand was superb in the commanding win in Dublin. Henry Slade (two tries) and Mako Vunipola (27 tackles) led the way for perhaps England’s best display under Jones, but the home side need to prove that golden display at the Aviva wasn’t a one off, and they can maintain these immense standards for the rest of the championship. Forty six dominant tackles in comparison to Ireland’s nine will obviously be difficult to match. However, the challenge should be to replicate the same display or better it against a team who have failed to win at Twickenham since 2005. Which France team will turn up? It’s hard to know which French team is going to take to the field on Sunday. Their opening round defeat to Wales at Stade de France is a classic example. Leading 16-0 and in control at half-time, Les Bleus imploded with a combination of poor mistakes and inconsistent decision making. Still ahead with ten minutes to go, a moment of madness from lock Sebastien Vahaamahina allowed George North to race in for a late try and go on to secure the win. With six changes made for the trip to the England capital, and the return of imposing centre Mathieu Bastareaud, France need to start showing some consistency, focus and tighten up when the pressure is on, and hold out for the full 80 minutes. 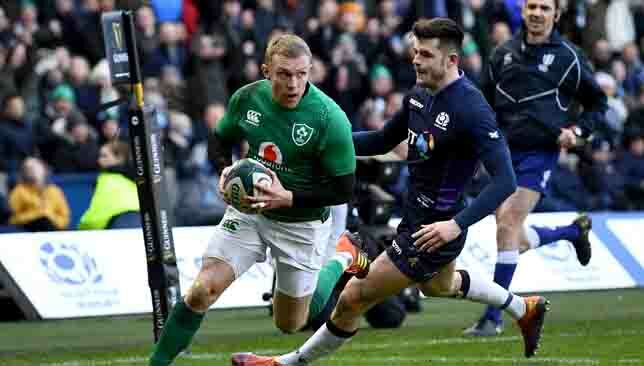 For a side so accustomed to lighting up Six Nations weekends, they have failed to flicker in past seasons and need to start showing some of their old class again, especially with some talented players coming through the ranks. Young guns or seasoned campaigners? If the depth and experience of the substitutes bench is anything to go by then England are head and shoulders above their opponents. With a combined 249 caps, Jones has worthy experience to call upon in 82-time capped prop Dan Cole, out-half George Ford (52 appearances) and lock Joe Launchbury (54 caps). Les Bleus, meanwhile, may be lacking in experience off the bench but have plenty of young talent waiting to shine. Prop Dany Priso (11 caps) and scrum-half Antoine Dupoint (10 caps) may be their so-called seasoned campaigners, despite only making their respective debuts in 2018. Romain Ntamack (19), Paul Willemse (26), Gregory Alldritt (21) and Pierre Bourgarit (21) have all only played once for the national side but will be looking to make an impact when introduced late in the game. Will England’s seasoned campaigners prove their influence in the final quarter or will France’s young guns sparkle? Billy Vunipola insists England must meet France’s giant carriers head on if they are to continue their march towards the Guinness Six Nations title. Paris was the setting for the tournament’s greatest comeback last weekend when Les Bleus built a 16-0 half-time lead against Wales before collapsing to a self-inflicted 24-19 defeat. Sebastien Vahaamahina only discovering that he had taken over the captaincy against Warren Gatland’s men when referee Wayne Barnes told him served to underscore the chaos in the French camp. Vunipola, however, has warned of the threat they pose if allowed to build a head of steam. 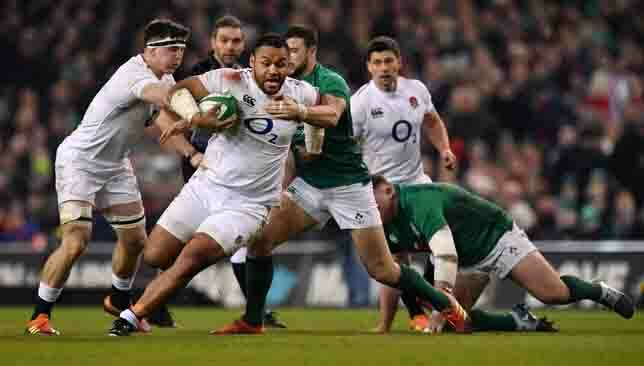 “What happened against Wales probably shows how dangerous they can be more than anything,” said Vunipola, a star of the 32-20 rout of Ireland in Dublin. “What Wales showed us was how not to start a game. If you give them a leg up, then France are extremely, extremely dangerous. “We’ve all played against French sides – once they start feeling it emotionally then they’re very, very tough to stop, so we can’t allow them to get into that position. “They’re massive blokes and if you give them momentum they’re tough to stop. As a pack we must confront the challenge of their big carriers. “They’ve made a few changes up front, but it’s probably added more to them than taking away any of their strengths. England made a remarkable start to the Six Nations by dismantling favourites Ireland in a performance which sounded an ominous warning to their rivals in World Cup year. Vunipola, who is back in the team after recovering from three successive broken arms, echoes Eddie Jones’ belief that sweeping aside Joe Schmidt’s champions is just the beginning. “The challenge is to be better. We’ve spoken all week about being better,” Vunipola said. England enter the round-two fixture armed with inside knowledge from attack coach Scott Wisemantel, who spent coaching spells at Top 14 clubs Clermont Auvergne, Montpellier and Lyon. “France is a great place to work and it gives you a really good insight into the psychology of the French,” Wisemantel said. “In an away game, there is an element of freedom about them. They don’t feel the pressure that they do at home. “The second thing is how they construct a game, penalties to build the score – three, six and nine, putting the pressure on the home side. Then if they are close on 60-65 minutes they can capitalise on any mistakes. When asked about the approach to conditioning in French rugby amid stories that players drink and smoke before games, Wisemantel said: “I have seen some crazy stuff over there!